Embroidery Business Startup-The Embroidery Coach can help you start! Do You Have An Embroidery Machine And Software And Think About Starting Your Own Embroidery Business? Where You Sold An Embroidery Machine And Thought You Were Now Ready To Start An Embroidery Business? The embroidery machine companies sell you the equipment and tell you that you can have a great business making a lot of money but they do not help you in any way to learn how to run your business or make money! Sometimes there is a paragraph in the manual about each subject that is absolutely no help to the new embroidery startup at all! They are told that they need a business plan and that they need to market their business. That is all well and good, but how do you do that? How do you write your business plan? How to you market your business? How to you price your products? Where do you start to find the right Business Form for my embroidery business? They just leave you hanging and have no training in any of these areas at all! There primary function is to keep the machines sales going. 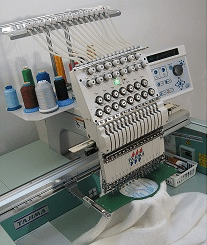 You may have been told that after you have your basic embroidery machine and software training that you are now ready to start running your embroidery business. You soon discover that this is not exactly true. In your mind, learning how to start an embroidery business should be easy. And maybe you’ve convinced yourself that any reasonable person should be able to learn this business without any problem. That is not true! You are a very smart and creative person, but that does not mean you have all of the right business skills, processes and tools in place to start running a profitable embroidery business! After spending hours on the internet searching for all of the information that you need, you quickly find that it is a long uphill battle trying to figure out how to find the right systems, approach and and tools to run your business efficiently and make any money at it! It is not easy! You spend so many days and nights searching for answers to your problems. As an embroidery business startup, you are faced with your customers bringing in items that you do not know how to handle, you are not sure what backings to use for certain fabrics, you want to learn how to avoid making mistakes, how to get customers to buy your products and the really big question is: how can I actually make any money in this business? That is where I, Joyce Jagger, The Embroidery Coach can help! My Mission is to Make Life Easier For All Embroiderers and Give You the Right Tools To Run Your Embroidery Businesses! I am very upset with the amount of embroidery businesses that have gone out of business when this was totally unnecessary! It was not their fault, they did not have the right tools to get started with and they were totally handicapped from the first day they started their business! I am Joyce Jagger, The Embroidery Coach and I simplify the business of embroidery into easy to understand lessons. My passion is to help get the new embroiderer’s business startup off to a fast start and help the more advanced embroiderer improve their skills so that they can provide higher quality embroidery and increase their profits! As a former owner of a profitable embroidery business I am now in the business of helping you as an embroidery business startup, to start your own profitable embroidery business or to help you take your current embroidery business to a higher profit level. I’ve spent over a decade helping other embroiderers get started and increase their profits. 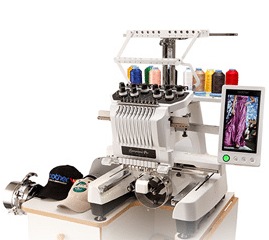 Embroidery can be a very lucrative business when you have the right systems, approach and tools in place! Before You Begin Your Embroidery Business! I know that is impossible, but if I had the power to make any changes in the way that an embroidery business is started, I would definitely structure a program that would teach new embroidery business startups about how to make money before they could actually start their embroidery business. They have so much to learn after they have their machine. How to write their business plan! How to market their embroidery business! How to price out their products! Where to find the right Business Forms for all areas of my Embroidery Business! None of these items are really covered by the Embroidery Machine Companies when they sell you a machine and tell you that you are not ready to start doing business. They DO NOT give you the Right Tools to help you get started in your Embroidery Business. I started this embroidery training business because I did not want to see other embroiderers have the to go through the long learning curve that I did. It took me years to learn how to run my embroidery business and learn how to make a profit. This is not the way that it should be! I see so many embroiderers struggling and they just go deeper into debt and do not know how to climb out. I know how this feels, I have been there! Click on the link and I will send you a the “Building The Foundation of Your Embroidery Business” Checklist for “Starting Your Embroidery Business” Today! This will truly give you the Steps that is takes to start your Embroidery Business and it will help you get started on your path to a Profitable Embroidery Business! Go through the checklist and get started on your journey today.